In this section, Rinpoche gives extensive advice on transforming depression by changing our focus from self to others. He shows us how to use depression on the path to enlightenment, so it becomes the best Dharma practice and the best way of healing ourselves. 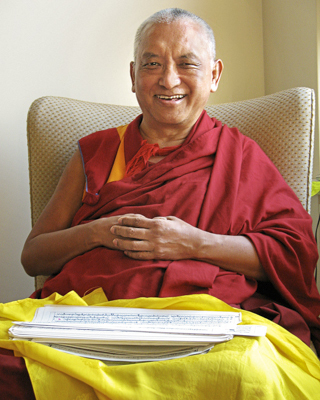 Rinpoche advises how to eliminate anger by practicing patience and thus contributing to world peace. There is also advice on attachment and desire, how to handle criticism and how to deal with a range of fears. Other negative emotions covered within this topic include jealousy and pride. Instead of feeling jealous and clinging with attachment to what we desire, Rinpoche emphasizes rejoicing in others’ happiness. When we are happy and enjoy our life, we have so much space in our mind to think of others, to cherish and love them. These advices show us how we need to see self-cherishing as the enemy. Everything we do should go toward defeating this inner enemy, and reducing our self-cherishing. This gives space for bodhicitta to grow, and we change our attitude in life from cherishing the “I” to cherishing others.